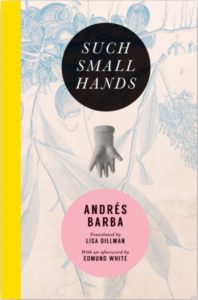 Such Small Hands, by Spanish author Andrés Barba, is a slender book that falls into that other category: a tidily executed project, one with tremendous tonal intimacy and rhythmic language. (Given the lovely and propulsive and inward-turned prose, it’s clear that translator Lisa Dillman has done a masterful job.) The basic story of Such Small Hands is simultaneously unique and familiar in its echo of fairy tale tropes: a girl’s parents die. She goes to live in an orphanage. Things get weird. Then they end. While the tensions that ensue are keenly captured, unsettling, and even awful, they’re inflicted upon us – and Marina, and the doll, and the girls, and one unfortunate caterpillar – in an almost context-free fugue state. We aren’t ever sure how to access Marina (more below), and nothing is told to us of how life was for the girls at the orphanage before Marina’s arrival. The implied idyllic state seems unlikely, and so this reads as if Barba has chosen to be faithful to the tidiness of his project rather than try to understand the more complex realities of orphanage life. To Barba, the point is Marina-as-disruption: the fact that and the manner in which Marina – through her scarredness (in the shower the girls gaze, rapt, at her wound), her worldliness (she has seen movies they’ve never heard of), her love for her doll (the girls dismember it), and her strange behaviors (she stabs a caterpillar) – disrupts their collective sense of self is all that matters. One of the jacket blurbs compares Such Small Hands to The Virgin Suicides; this is misleading. While Such Small Hands does have a collective We unsettled by an Other, this group of orphaned girls is no stand-in for society, and the Other is not a representation of what happens when society begins to decay. In Eugenides’s novel, the boys are clearly haunted by the Lisbon girls, and the past tense is crucial to his tale; here, the orphaned girls are looking back at their short time with Marina without any clear self-criticism or self-awareness, and the impact and meaning of these events – either to us or to the characters (save Marina) – are ultimately hard to pin down. I’m not sure that this is a criticism; Barba has intentionally chosen not to hold the readers’ hand and reassure us that yes, the way we feel toward the book – toward Marina, toward the girls – is how we’re supposed to feel. Still, one might wish that we were clearly meant to feel more unsettled than uncertain. The final section becomes literary: Marina, hated by the girls by day, takes power over them at night as she invents a game one of the girls (chosen by Marina) is dressed up and treated like a doll until morning. The chosen girl can’t resist, can’t speak, can’t be willful. This part of the novel speeds toward its conclusion, and the collective nature of the orphanage girls – they are never individualized – limits Barba to summary. Ultimately, it’s the doll that defines Barba’s project. Dollness is referenced in the title. It is Marina’s therapy. The girls are transfixed by the doll until they destroy it, yet the doll rises again in Marina’s strange game, only to be destroyed once more. The use of the doll is more literary device than representation of reality; it is intricately psychological, symbolic, allusive . . . and not of the real world. And so with Such Small Hands: beautiful very much in the manner of a Sally Mann self-portrait: precise in its plotting and intention, thick with mood and gloom, with a quietly dreadful bizarreness. It’s disarming and strange and wonderfully awful – and constructed very skillfully. And as with Mann’s work, it feels constructed, more a carefully arranged system-in-a-novel than that imperfect torrent. This is not meant as a criticism, either: the second joke about Amalfitano’s assertion is that Bolaño’s non-2666 projects are tidy compositions, works less life-like than doll-like. Tidiness doesn’t diminish their excellence any more than it diminishes just how very impressive Such Small Hands is, along with the particular and quite apparent talent of Andrés Barba. Sean Bernard’s fiction has appeared in numerous journals, most recently in The Common, Crazyhorse, and Western Humanities Review. His debut novel, Studies in the Hereafter, was published in 2015; in 2014, his collection Desert sonorous was awarded the Juniper Prize in fiction. He teaches creative writing at the University of La Verne.